A burning permit grants the individual holder the right to burn small amounts of dry leaves, plant clippings, brush, and clean untreated-unpainted wood as long as weather conditions do not pose a fire hazard. Burning Permit information by county. When the fire is more than 3 feet high and 3 feet in diameter. When the ground is not completely covered by a minimum of 3 inches of snow. When the fire is not contained in either an approved burner or in a cooking or heating device such as charcoal grill or camp stove. Where county or other local jurisdiction requires a burning permit year round or for all sizes of fires. How do I activate my burning permit? You can also activate it by calling 1- 866-533-2876 and follow the instructions in the pre-recorded message. Why do you have to activate the permit daily before burning? When the permit is activated, it shows on a map. The map is viewed by local dispatch offices, law enforcement and fire departments. To provide a clear map for these emergency managers, the map is reset every day at 8:00 a.m., so they know who is actively burning that day. for a fire in an approved burner, and there is no combustible material within 5 feet of the base of the burner, and it is in use between the 6:00 p.m. and 8:00 a.m.
You may burn vegetative material, such as grass, leaves, brush, and untreated lumber. More information on approved barrels. What if I want to burn a structure? If you'd like to burn a structure, contact a DNR Forestry Officer. Burning permits are not issued in fire-prone portions of the state in the spring when fire danger is traditionally high. A variance to permit open burning, however, may be obtained for special circumstances such as prescribed fire projects, approved agricultural practices, construction projects, or economic hardship. Variances may only be issued by DNR Forestry personnel. Dates of the restrictions are posted on this website each spring. These spring restrictions only regulate fires that require a permit. Recreational campfires are still allowed under annual spring restrictions. What are spring burning restrictions? Beginning in 2001 the DNR instituted spring burning permit restrictions in the fire prone portions of the state each spring. During this period of traditionally high fire danger, burning permits are not issued. Dates of the restrictions are posted on the DNR Web site each spring. Restricting the issuing of burning permits is a not a "burning ban." A burning ban stops all open burning, whether or not regulated by permit. Recreational campfires are still permissible under burning permit restrictions, but not under a burning ban. How are the dates for spring restrictions determined? Restrictions are determined based on the availability and condition of fine fuels such as standing dead vegetation in fields, swamps, and other open areas that can be totally wet but when conditions change can dry and burn in a matter of hours. These fine fuels play a role in most fires responded to each year because when dry they ignite easily and can spread fire quickly. Once restrictions are established in an area, they remain in place until green-up occurs and fire danger is drastically reduced. 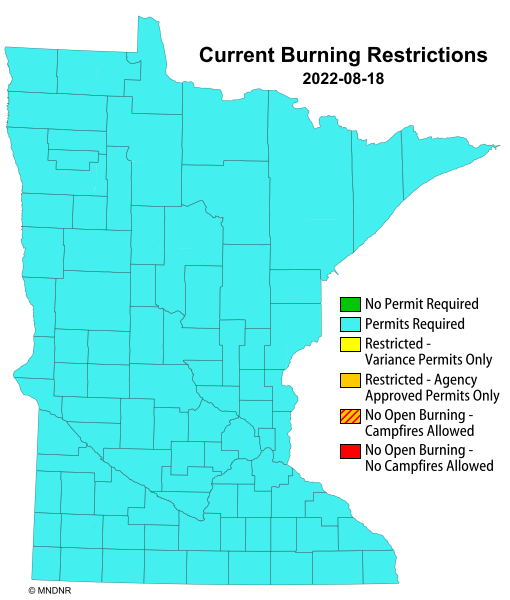 A burning ban is a restriction issued for a specified part of the state under extremely dry conditions in which existing burning permits are canceled and new permits not issued. Burning in approved burners, recreational fires, and even smoking outdoors may be prohibited, depending on the fire danger. This action is generally taken when fire risk becomes extreme across a broad area of the state. A burning ban is used only in the most severe conditions and is more restrictive. What is a variance permit? Report any suspected unauthorized fires by calling 911. (If 911 is not available in your area, your local DNR Forestry office can provide you with the numbers to call; call collect if necessary.) If in doubt, report a fire. An early report helps keep fires small. information on whether anyone is working on the fire. 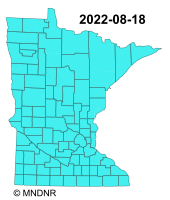 Please note that while DNR issues statewide regulations, if you live within a municipality that controls the open burning, local permits or more stringent regulations may apply.